Manila, Philippines - President Rodrigo Duterte finally revealed test conducted at the Cardinal Santos Hospital, showing 'Negative' result, meaning 'Cancer-Free' after sparking speculations about his recent cancer test. In a press conference with the members of the Malacañang Press Corp at Heroes Tuesday night, Duterte said "Dito sa Pilipinas Negative Ako." The 73-year-old President, has regularly prompted theorising about his health by skipping events or discussing his ailments in public since taking power in 2016. Special Assistant to the President Bong Go told reporters, "Sorry to disappoint his critics, the President is very healthy and in high spirits. I know for a fact that he is cancer-free." "He will finish his term and live beyond 2011. Tuloy lang po ang aming trabaho. Salamat po sa inyong concern sa kaniyang kalusugan. I assure you, there is nothing to worry about," he added. Critics has demanded public disclosure, citing a provision in the constitution that says "in case of serious illness of the president, the public shall be notified of the state of his health." 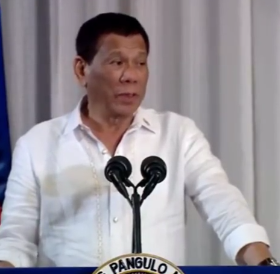 Previously, Duterte unveiled that he was suffering from daily migraines and ailments including Buerger's disease, an illness that affects the veins and the arteries of the limbs, and is usually due to smoking.